It is Diwali time again. Many of our readers were asking to post new sweets. As most of our traditional sweets are already on this blog, I was searching for new sweets. I came across these cornflakes rolls on one of the TV shows. 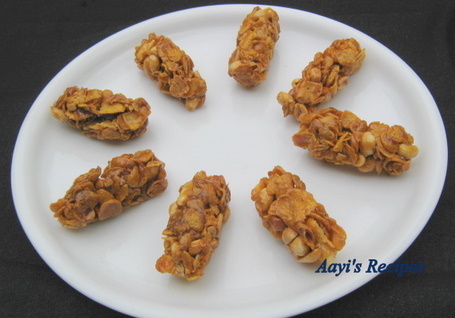 It attracted me as it can be done in a very short time (10-15 mins only) and we require minimum number of ingredients. I prepared these at home. They came out very well and all liked it. Heat jaggery with 2 tbl spn water (if using the normal jaggery). 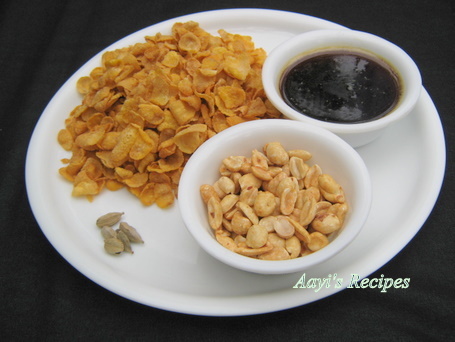 It can also be made with molasses (the black colored liquid jaggery, do not add water if you are using molasses). I tried here with molasses. Keep the heat on medium, because jaggery gets burnt very easily. Take little water in a plate and add a drop of the jaggery in it. The jaggery should sit like a drop without getting diluted. That shows it has reached the required consistency. Take off the heat, now add the Cornflakes and peanuts Mix well. Add the cardamom powder. Mix again. Apply some ghee to your palms. Take around 1 tblspn of mixture and make a roll of it. Wow, that’s real quick and easy! Super cute looking rolls, feel like grabbing some.. These sound so so good!! Ooh- I can imagine they are crunchy, sweet little bites- I have all the ingredients and will give this recipe a try. Shilpa Happy Diwali to you and your dear ones. Happy dipavali to u and ur family. A good recipe both for children and also elders.